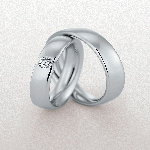 Platinum is the purest, rarest and most enduring precious metal on our planet. Whilst it melts the hearts of lovers all over the world, it takes 1772°c to melt platinum itself. This noble metal is extremely kind to the skin (hypoallergenic) complimented by a unique silky texture. It has a weight and presence that exudes rarity and status. 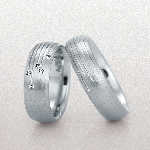 The pure white lustre of platinum shines like the moon. 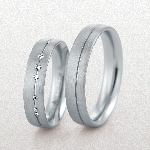 And if you look very carefully, you can see moon-dust in every Christian Bauer platinum ring! For more than 4000 years gold has been the traditional choice for precious jewellery, portable wealth and payment across countries and continents. It has fascinated man from the very beginnings of civilisation. Its unique colour, weight and malleability have given it a special place in the hearts of mankind. 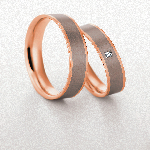 Today Christian Bauer takes this amazing metal and forges it into the most fabulous wedding rings in the world. 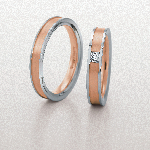 With the Christian Bauer ‘system collection’ you can design your own ring. Which profile should you choose? 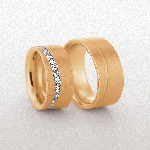 Would you prefer platinum of gold? 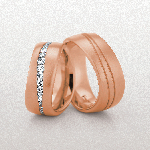 Which width would look best and which finish, polished or satin? 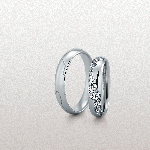 Perhaps a diamond would add something special or maybe more than one. Finally, a special message laser-engraved inside would add a really personal touch, especially in your partners own handwriting!